Carpal tunnel syndrome (CTS) is a condition that arises when the median nerve becomes compressed as it travels through the bony tunnel made up of the eight small carpal bones of the wrist. Its symptoms include pain, numbness, and tingling in the thumb, index, middle, and thumb-side half of the ring finger. If the pressure is great enough, weakness in grip and pinch strength can occur as well. There are many conditions or factors that contribute to and/or cause CTS, which can complicate its diagnosis and treatment. Some of these include: diabetes, obesity, pregnancy, birth control pills, hypothyroid (low thyroid function), arthritis, smoking, alcohol abuse, poor nutrition, being female (due to wrist size and/or hormonal shifts), bony abnormalities (such as spurs, misalignment of the carpal bones, and tunnel shape), aging, and certain occupations (heavy manual labor, vibrating tools, high repetitive tasks, firm gripping requirements, food servers, dental hygienists). Additionally, impingement of the median nerve as it passes through other structures in the body can contribute to a patient’s symptoms, so it’s important for a doctor of chiropractic to examine the entire course of the nerve—from the neck to the shoulder to the elbow and then to the wrist. In some cases, the median nerve may not be impeded as it passes through the carpal tunnel but rather, there is pressure on the nerve elsewhere that causes symptoms similar to CTS. In these instances, if treatment only focused on the wrist, the patient may not have a successful outcome. Outside of an urgent condition, like a broken wrist that may require surgery to take pressure of the median nerve, treatment guidelines recommend using conservative (non-surgical) approaches first. This can include addressing any activities that place pressure on the nerve (making changes to a workstation, for example) or conditions that may contribute to inflammation or swelling in the wrist. Inflammation within the carpal tunnel can be reduced using both ice therapy, as well as by consuming turmeric, ginger, and other spices with anti-inflammatory properties. To restore normal motion to the joints in which the median nerve may be compressed, doctors of chiropractic may utilize manual therapies such as manipulation and mobilization. 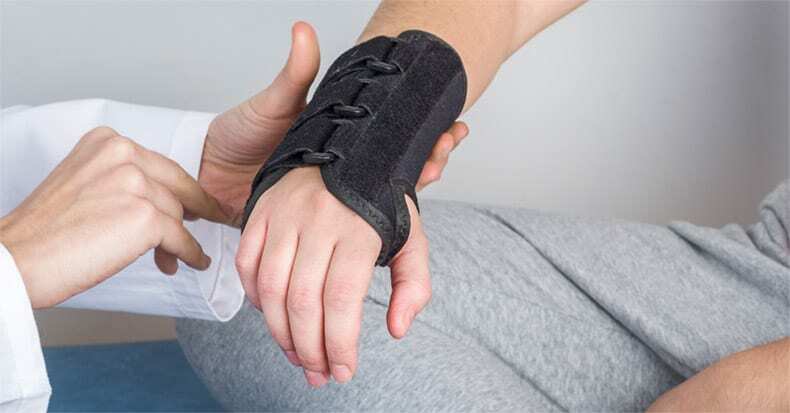 Patients may also wear a wrist splint at night in order to avoid increased pressure caused by bending the wrist in an effort to find a comfortable sleeping position.